Eagle Technologies is proud to introduce the Eagle Universal Base, or EUB. This revolutionary new product has been developed to lower capital equipment costs and maximize utilization of the capital expense across multiple customer platforms. It consists of two parts, the base, which is generic but customizable to your plant standards; and the fixture which is customer program specific and 100% tooling. The base has been designed with many features and benefits common to all automatic machinery. It is ergonomic with electric height adjust controlled from the color touch screen, or HMI. It has a three sided light curtain so the operator has full access to the fixture. It is ambidextrous with the HMI and operator pushbuttons able to be set on the left or right of the station. It includes vibrant LED lighting and an operator fan for comfort. Dual colored easy lights and full touch-screen functionality keep your operators informed. 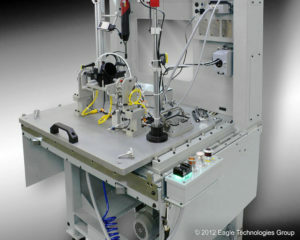 Standardized control package saves money and time with quick delivery and a full list of features. 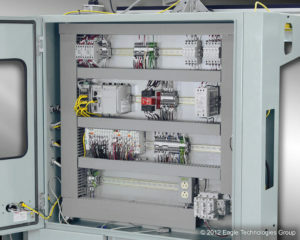 The Allen Bradley based PLC control includes Ethernet-IP connectivity and a pre-designed control system to save you money. Courtesy outlets, programming ports, serial interfaces, and predesigned options for screw driving, leak testing, part marking are included. Valves are prewired and plumbed, ready for configuration to your application. Fixture connectivity is true plug and play. Electrical and Pneumatic connections are all through bulkhead fittings. No tools required. Fixture changeover is done in less than sixty seconds. 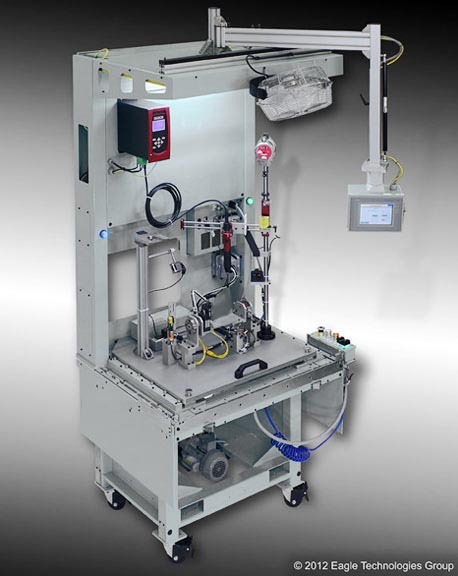 You now have the ability to changeover many times a day with no loss in throughput. Best yet, 110 V single phase power and plant air is all you need. Robust cam followers and support rollers make it easy for any operator to change a fixture. Docking features are built in for positioning and securing a fixture cart. Fixtures include docking nests for the bulkhead connectors. Thumbscrews secure the fixture to the base. The operator panel includes a lighted opto-touch button, Lighted amber fault pushbutton, and E-stop and a power on pushbutton. The pushbutton panel hangs from the base rails and can be positioned on either side or anywhere along the front of the base. Two multicolor easy lights are mounted at eye level on the rear panel for operator indications. There is ample room on the back panel of the base to mount optional accessories. These are specified by the customer but have included DC electric drivers, leak testers for pressure or vacuum decay, part markers, Oetiker clamps, etc. The HMI is on a swivel arm for easy positioning on the left or right of the station. The panel itself is also height adjustable, so the fixture work height and the sightline of the HMI can be set independently. A courtesy airline is also provided for blowing off the fixture and keeping the work surface clean. Get it done, get a quote today! 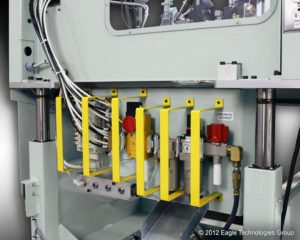 Contact Eagle Technologies today so we can show you how to shorten the time to launch, lower your capital expense, and maximize your machine throughput.